The Capital Grille, who's name has always been synonymous with fine dry aged steaks, is adding some more premium beef to the menu. Just in time to celebrate National Hamburger Month, The Capital Grille has added a variety of all new burgers to the lunch menu at its Millenia location. Since the Capital Grille is all about quality beef, you can be assured that we are talking about gourmet quality Wagyu beef burgers with a variety of premium toppings. With ingredients ranging from Kona Crust and Shallot Mayo to a 15 Year Aged Balsamic with Wild Mushrooms, these are not your standard establishment burgers. Along with the already popular The Grilles Signature Cheeseburger, The Capital Grille's burger lineup is pretty impressive. 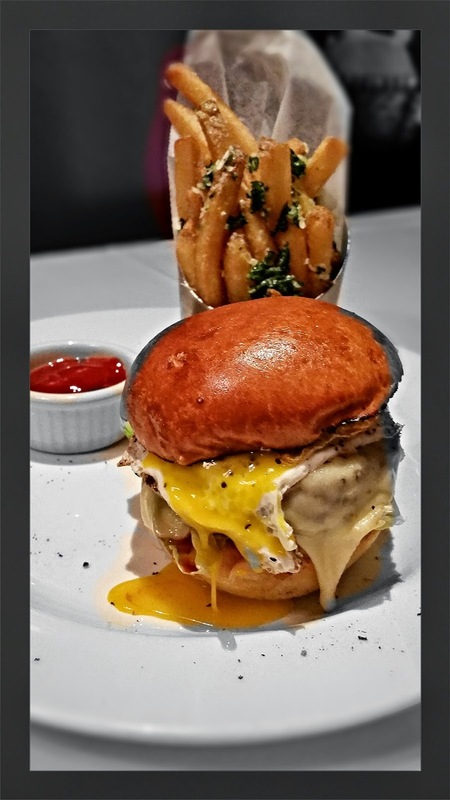 Since I'm always a sucker for that beautiful yellow yolk dripping down the side of my burger, I decided to have the Wagyu Cheeseburger with Fried Egg. This was an extremely moist and tender burger that really just dissolved in your mouth. The burger was cooked to a perfect medium as requested and the egg on top was fried perfectly as well. 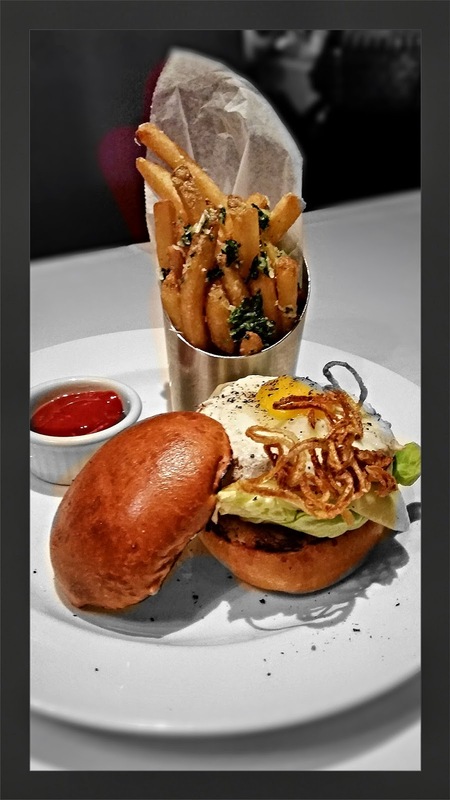 All burgers come with a side Parmesan Truffle Fries. You can switch them out if you'd like, but if you have never had the fries at The Capital Grille, I recommend you do soon . The deliciously coated fries have become almost as popular as the steaks. 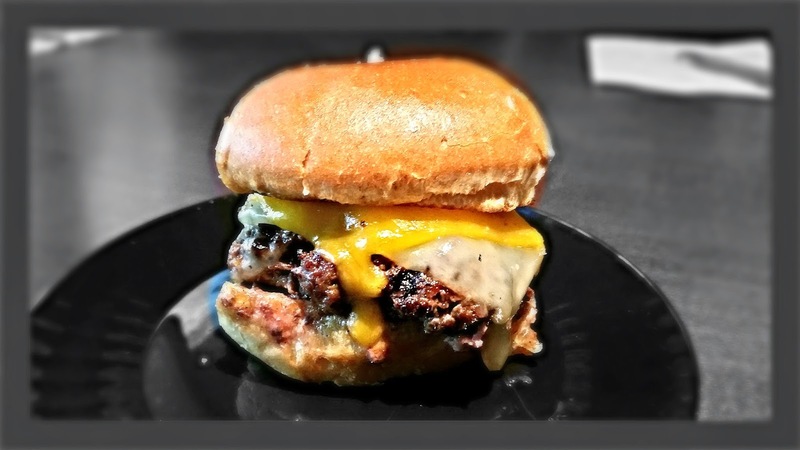 Make no mistake, we are talking about burgers that are on the high end of the price scale at $17.00 and up, but I can tell you...this was certainly a burger that is worth the price tag. These are power burgers designed for power lunches. Here is some of that wonderful egg drool footage. It was a beautiful thing to behold. 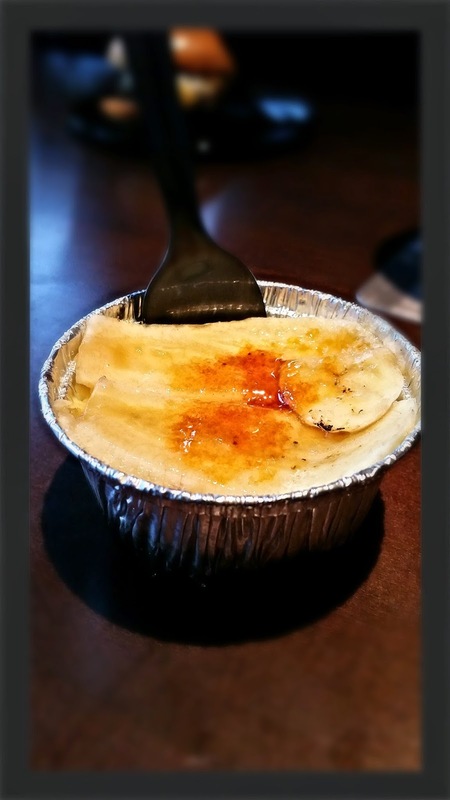 I could not resist having desert before I left, so I ordered the Creme Brulee. 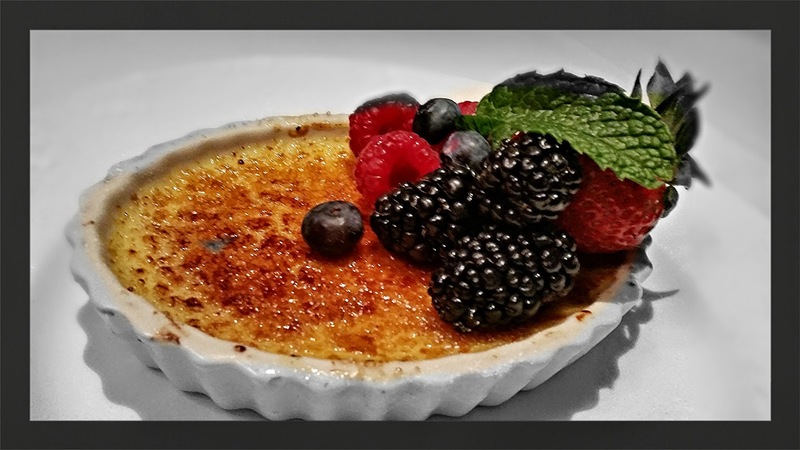 This was a very traditional creamy and smooth Creme Brulee with fresh fruits and a beautifully caramelized sugar crust. 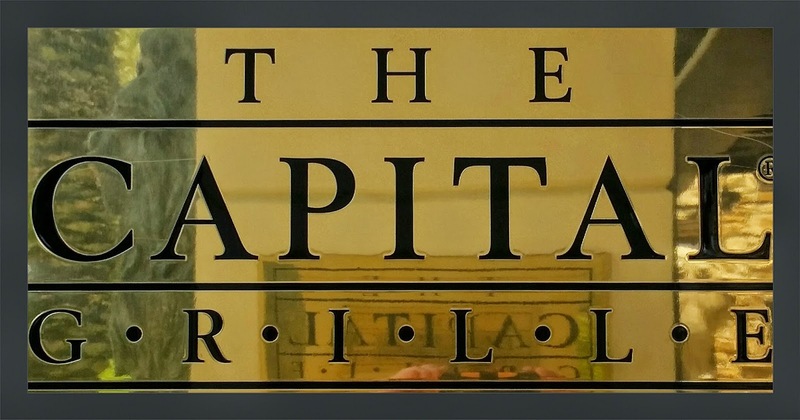 The Capital Grille at Mall at Millenia is open for lunch from 11:30 am to 4:00 pm, which will give you plenty of time to stop by and grab a burger and get your power lunch meeting going in the right direction. 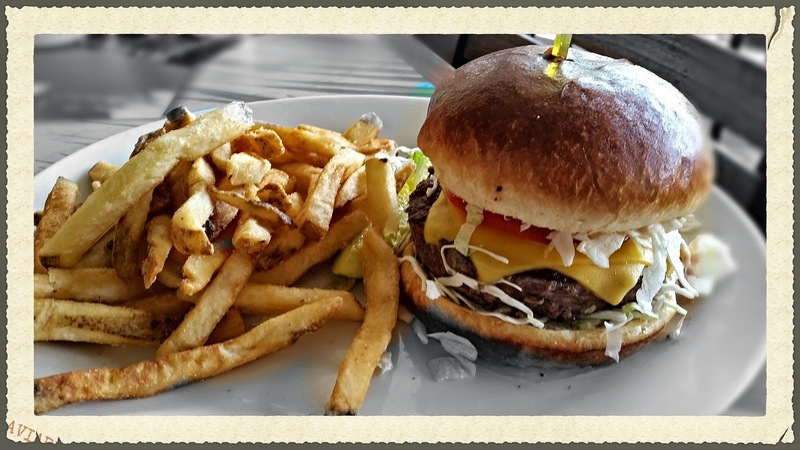 According to Jimmy Buffet a cheeseburger is paradise...heaven on earth with an onion slice...not too particular, not too precise, and that makes Margaritaville a great place to celebrate National Hamburger Month. Yes, National Hamburger Month is a real commemorative month long celebration, and that means you should be out celebrating by eating as many hamburgers as you possibly can. The Orlando Margaritaville, along with other locations across the country is celebrating by adding some new and tasty burgers to its menu that thousands of fans across the country had some input on. Those fans were encouraged to share their version of the perfect hamburger. The burger components surveyed ranged from the preferred type of patty to toppings, condiments, buns and sides. Out of more than 17,000 respondents, almost 82 percent of those surveyed preferred beef to turkey or vegetarian patties. An astounding 93 percent voted cheese as the number one topping, with cheddar as the favorite. Lettuce, tomato, bacon and pickles also got top votes. Ketchup, mayonnaise and mustard were the most popular condiments with barbecue sauce and Heinz 57 coming in fourth and fifth place. Naturally, the favorite side item was French fried potatoes with 77 percent of the respondents opting for a big kosher pickle and 53 percent choosing a cold draft beer as their beverage of choice to enjoy with their burger. With the help of those fans and Margaritaville's culinary director Bill Rohm, they have designed three all new burgers that include a Baja Burger, a Chimichuri Burger, and a Bayou Burger all topped on a toasted brioche bun. 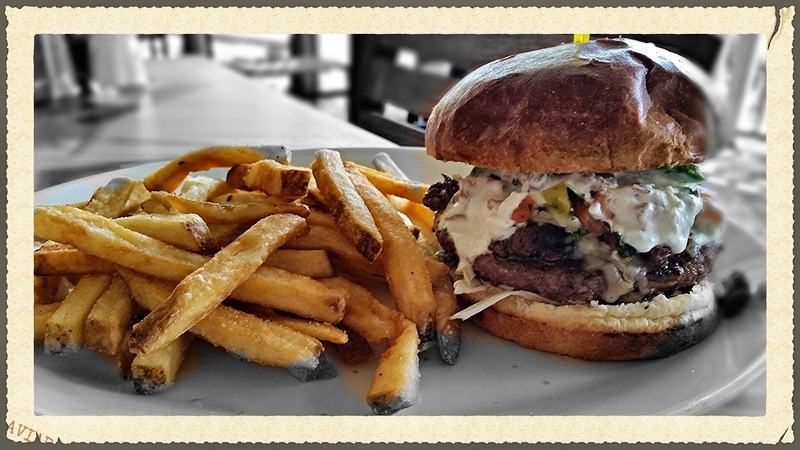 The Baja Burger is topped with carne asada, Oaxaca and Monterey jack cheese, avocado, pico de gallo, and a key lime crema. This burger had a mouth full of flavor, and two types of grilled beef. 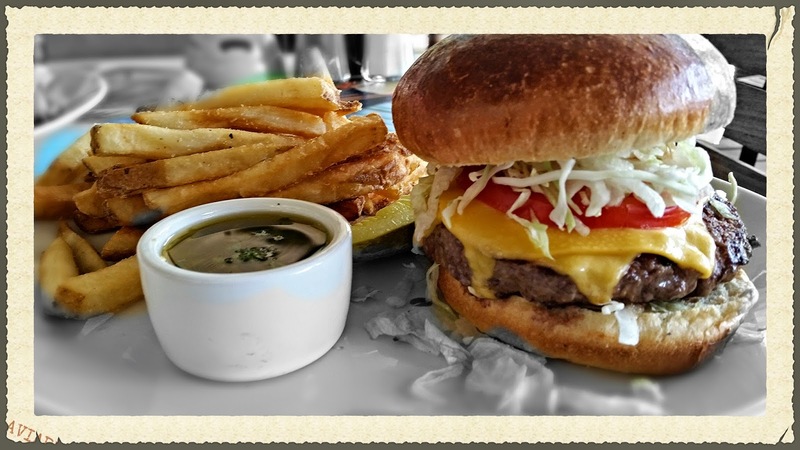 The Chimichurri Burger is a standard burger with all the trimmings and a side of chimichurri sauce. I really enjoyed the distinct flavor the chimichurri sauce added, and it was my guests favorite burger. 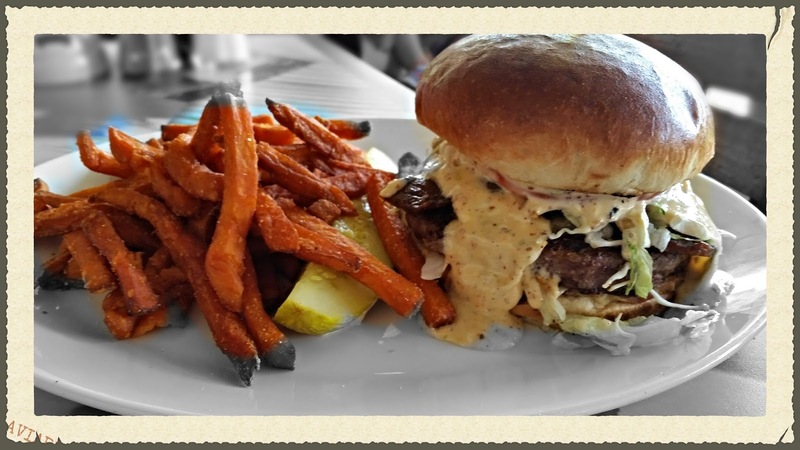 My personal favorite was the Bayou Burger that is seasoned with Cajun Spices and topped with caramelized onions, Andouille bacon and a Cajun remoulade. The famous "Cheeseburger In Paradise is available year round. Simple toppings like American cheese, lettuce, tomato and a special Paradise Island Sauce always make this a good choice. In addition to burgers, Margaritaville has a pretty expansive menu selection that has been recently updated. You can see the full review I did for the new menu roll out by clicking HERE. 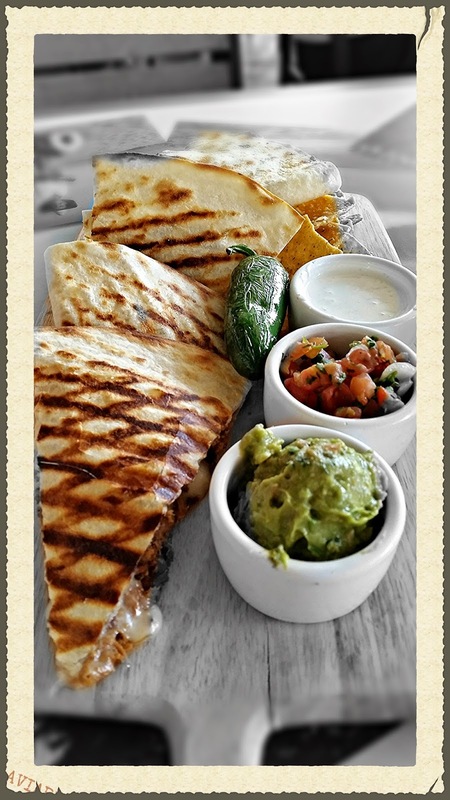 The Key West Quesadillas stuffed with the braised pork carnitas are not to be missed. We ended our visit with a selection of Mini Deserts that included red velvet cake, carrot cake, Oreo mud pie with worms, Reeses Pieces desert mini and a decadent chocolate overload. These desert minis were rich in flavor and fun to eat. We enjoyed them all. 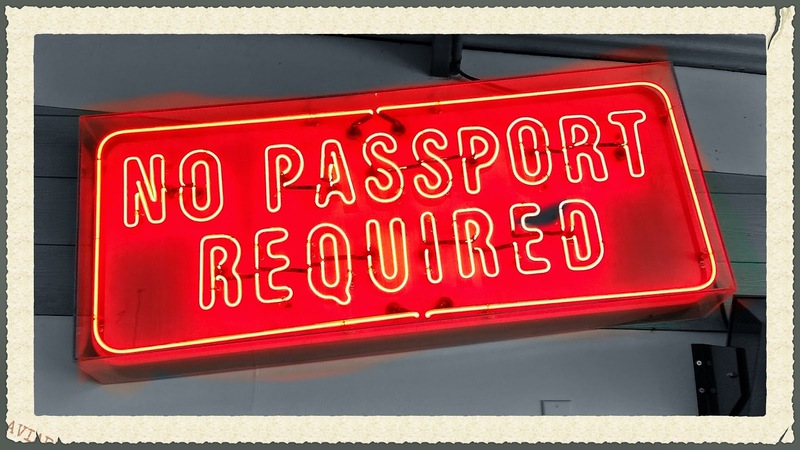 Just like the signs says on the porch of indecision...there's "No Passport Required" to enjoy a cheeseburger in paradise at Margaritaville. Do what Jimmy Buffet would do, and make the best of every virtue and vice...It'll be worth every damn bit of sacrifice to get a cheeseburger in paradise. 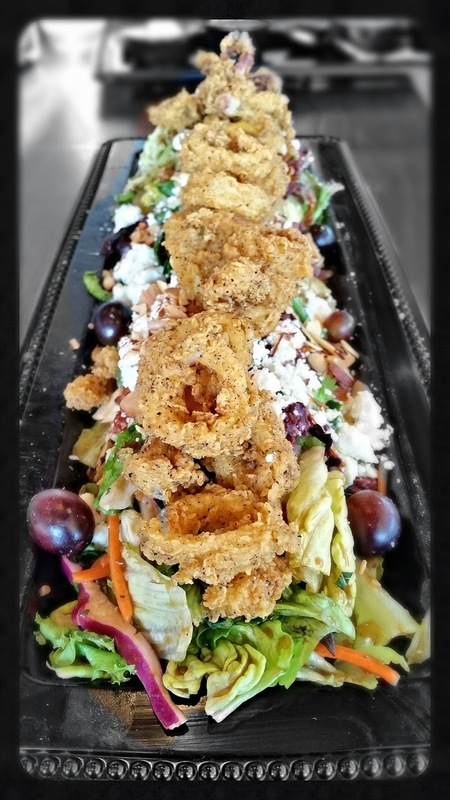 Fresh To Order is the newest addition to Waterford Lakes Town Center and they are serving up some pretty darn good food at affordable prices. I recently got the chance to sit down with Giriam Patel, who is Fresh To Order's newest franchisee. Of course we discussed many things, but the topic of the day was great food at great prices. Giriam is a longtime restaurateur and a former Golden Corral franchise owner. The Waterford Lakes location is the first one in Florida, and Giriam is so excited at the potential this brand has, that he has signed on to open seven more Fresh To Order restaurants in Orlando. Founded in Atlanta in 2006, Fresh To Order or (f2o), as they like to say, is credited with being the pioneer of the "fast-fine" restaurant segment. The fast-fine food idea is a current trend that aims to combine the quality of food found in casual fine dining with the operating platform and price point of fast casual establishments like Chipotle. Fresh To Order serves a menu of freshly prepared entrees like, Brown Sugar Roasted Pork Loin and Grilled Salmon with Black Bean Orange Sauce, as well as Panini sandwiches, soups and salads in less than 10 minutes for around $10. 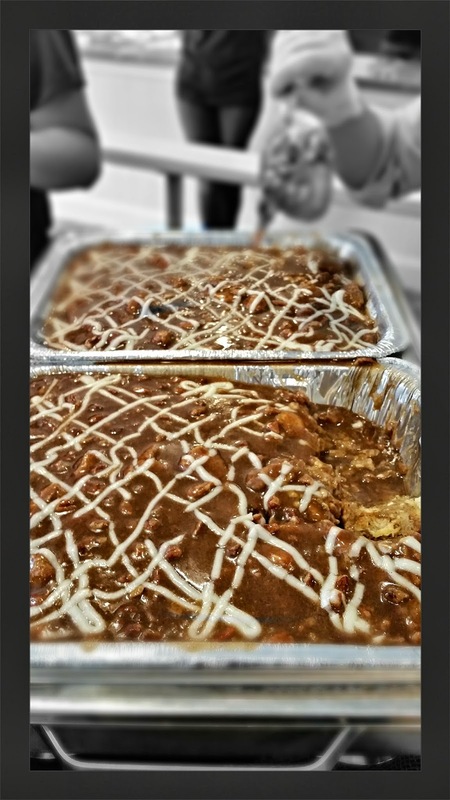 All food is made in house and made from scratch each day with ingredients delivered on a daily basis. Food at Fresh To Order is cooked fresh to order... as the name would imply. 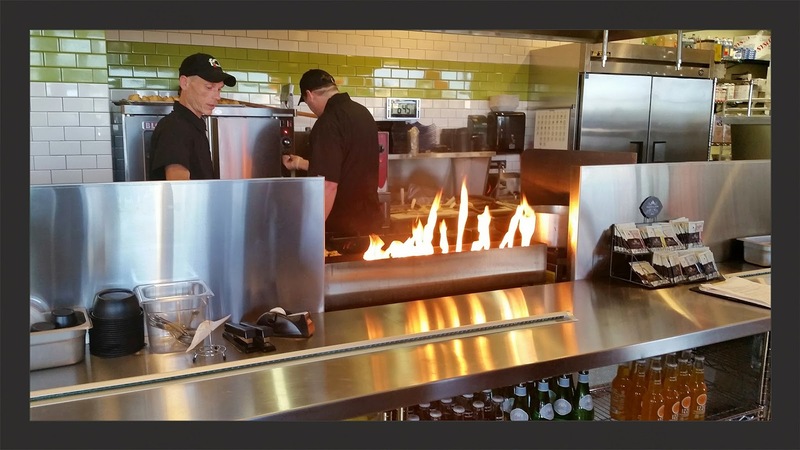 A variety of meats are cooked on their big open flame grill. 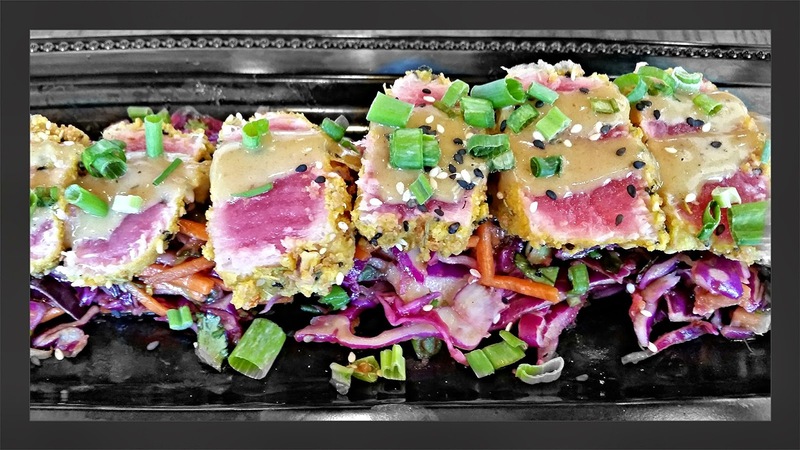 The Almond Crusted Seared Tuna is served with Asian slaw and a Dijon vinaigrette. I've had quite a few versions of seared tuna before, but never with such a delicious and flavorful crust. I thought the Crispy Calamari was very good. Its on par with what you would get at some finer restaurants and pay over $20 for. The dish comes with fried lemon slices, wheat berry rice and an oriental apricot dressing. 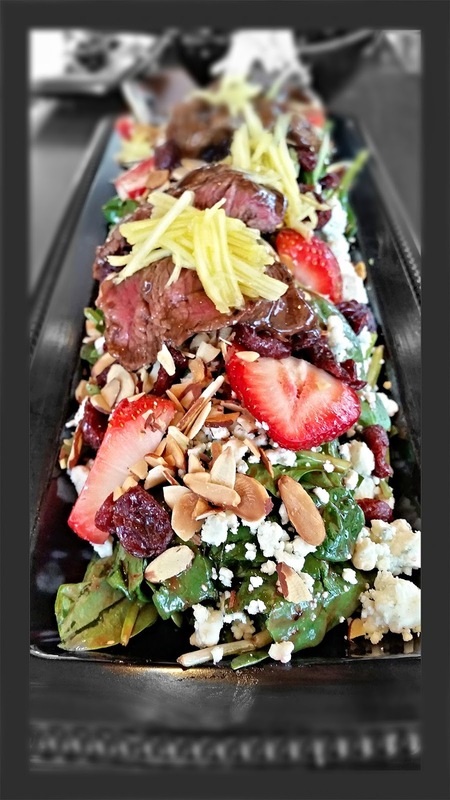 We were treated to the Spinach Salad that combines seasonal fruit, Spinach, strawberries, blue cheese crumbles, dried cherries, and almonds. Salads are available by themselves, or you can add a protein to them. Our salad was topped with the addition of Bourbon Filet Steak and a raspberry vinaigrette. The flavors and textures of this salad worked perfectly...and made this a salad to remember. 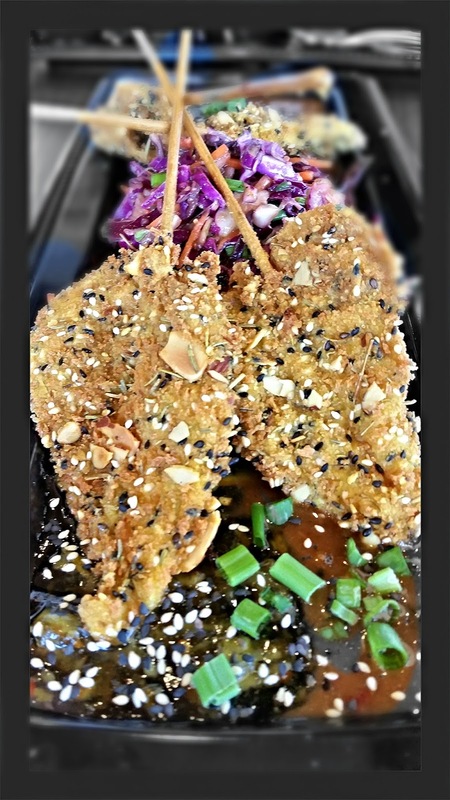 The Almond Chicken Skewers are a big part of Fresh To Order's success. The Chicken is coated in a house made almond rosemary Crust and fried up perfectly. One bite is all you need, and you will be hooked. 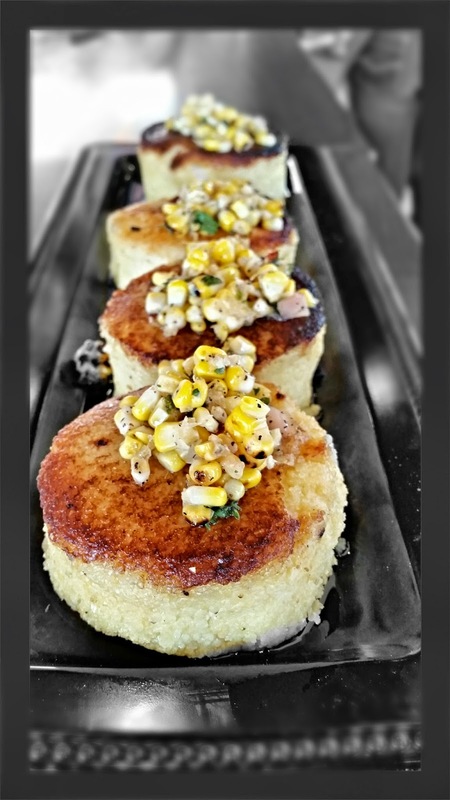 For something a little different with a southern flair, we tried The Garlic Jack Grit Cakes. They are served as a side addition, but the portion size would make them great for sharing as an appetizer. The Sweet Mashed Potatoes as well as the Garlic Mashed Potatoes were about as close to an authentic home made taste as I've had at any restaurant. 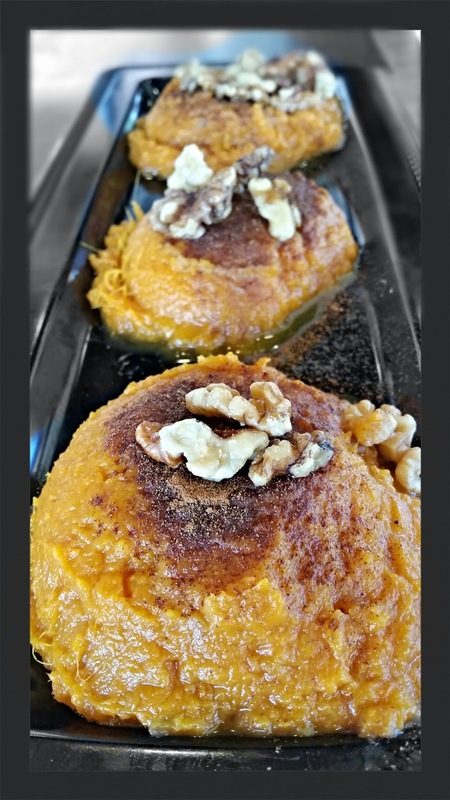 The garlic mashed potatoes were chunky and full of flavor, and the sweet mashed potatoes gave me flashbacks of eating a fine diner at my grandmothers house. 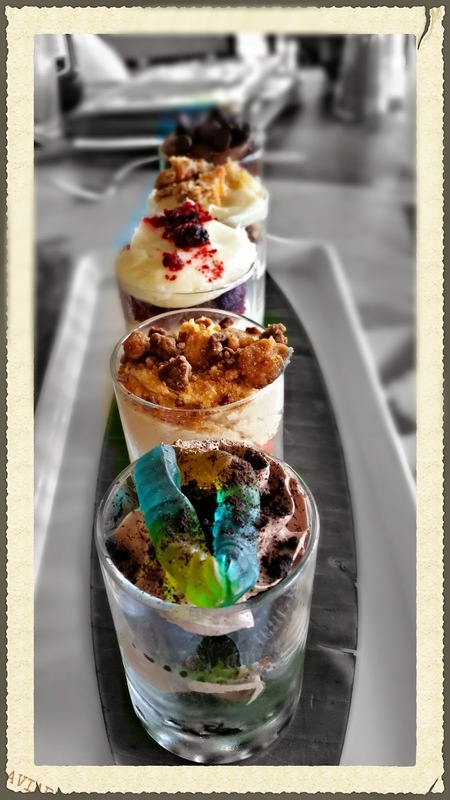 If you have a sweet tooth like me, you will enjoy all of the delicious deserts available at Fresh To Order. We sampled just about everything from brownies to cookies to cupcakes that were made fresh from scratch. I can honestly tell you that I did not know what to expect upon my arrival, but I left pretty amazed. All of the food I tasted was delicious, and when you consider the portion size and price point, I was impressed even more. Fresh To Order’s chef-inspired food reflects bold flavors and high-end, tantalizing tastes at user friendly prices. 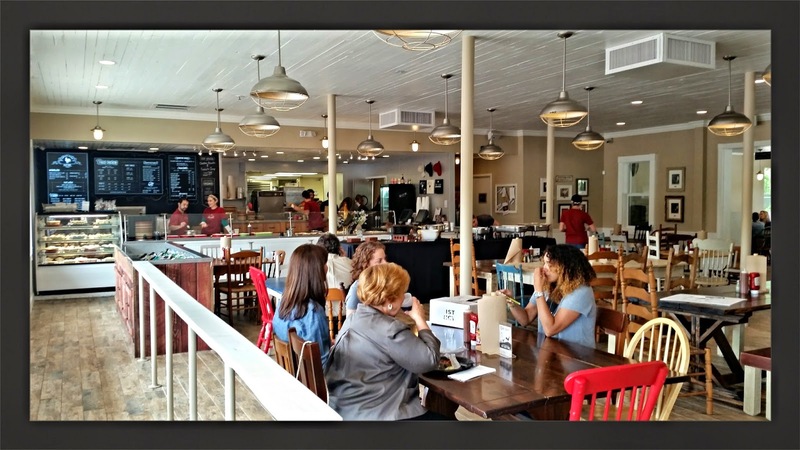 I really enjoyed every aspect of the Fresh To Order Concept and think you will too. Stop by and tell Giriam Hello! "Innovative Dining Concept To Debut This Summer"
LAKE BUENA VISTA, Fla. – Gearing up toward its opening this summer, B Resort, located in the Walt Disney World Resort, announces an innovative dining concept developed in partnership with restaurateur Jeffrey Chodorow and China Grill Management. The renowned group, of famed China Grill and Asia de Cuba, will showcase its food and beverage expertise with the inaugural location of its newest concept, American Q, which promises to showcase a modern take on classic barbeque. Located just off the lobby, the signature restaurant will feature an a la carte menu of barbeque specialties from more than a dozen regions throughout the United States and Latin America, as well as an “all-you-can-eat” parade of BBQ meats, seafood and poultry, continuously served tableside by American Q’s ”cowboy/cowgirl” carvers. Guests will enjoy an appetizer and salad buffet served from the bed of a ’50 cherry red Ford F1 pickup truck. 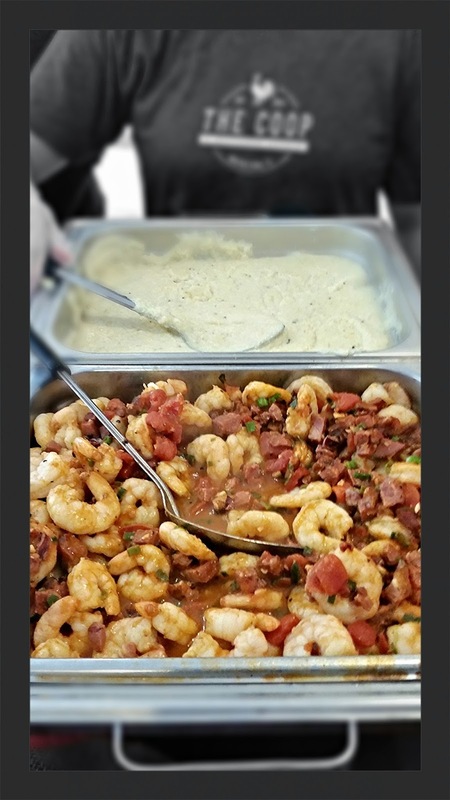 Freshly made sides and cornbread skillets, all served family style, will be enjoyed as guests revel in the fun of spontaneous line dances, led by their friendly servers. A full bar will serve creative cocktails, wines and a large selection of craft beers from regions throughout North America. American Q will offer a children’s menu aiming to win over the next generation of barbeque fans, completing the American Q dining experience. A distressed brick smokehouse, barn-inspired wood-clad bar and mason jar chandeliers add to the modern yet nostalgic “industrial farmhouse” charm of this American BBQ original, which will be open daily for breakfast and dinner. The lifestyle resort brings a burst of bright and contemporary hotel design when it opens this summer. Ideally located, the resort is within walking distance to the Downtown Disney® area and just five miles from the Walt Disney World® Theme Parks. 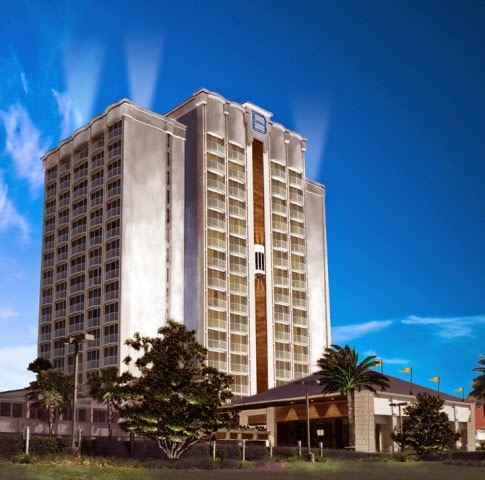 In addition, B Resort is conveniently located 10 minutes from the Orange County Convention Center and approximately 20 minutes from Orlando International Airport and downtown Orlando. Part of the stylish B Hotels & Resorts portfolio, the 394-room hotel targets sophisticated travelers, including couples, families, groups and business travelers. A vast array of amenities offers a balanced Orlando experience, equally engaging for adults and children. Yard House is one of the first tenants open for business at what is going to be a very distinct address on International Drive, and Tastes Of Orlando got to preview the new location. That distinct address is going to be known as I-Drive 360, which will be the home of a 400 ft. tall observation wheel. The wheel features enclosed air conditioned cars that will give you a view that can stretch for miles. If you are familiar with the London Eye, The Orlando Eye will be similar. Riders will be able to see as far as Sea World, Epcot and Universal. It's being reported, that on a clear day, you will even be able to see Kennedy Space Center. The wheel will act as the centerpiece of the attraction area that will also include Madame Tussauds wax museum and a Sea Life Aquarium along with other shops and restaurants. Yard House is one of Darden Restaurants newest acquisitions to its Specialty Restaurant Group, which includes The Capital Grille, Bahama Breeze, Seasons 52 and Eddie V's. 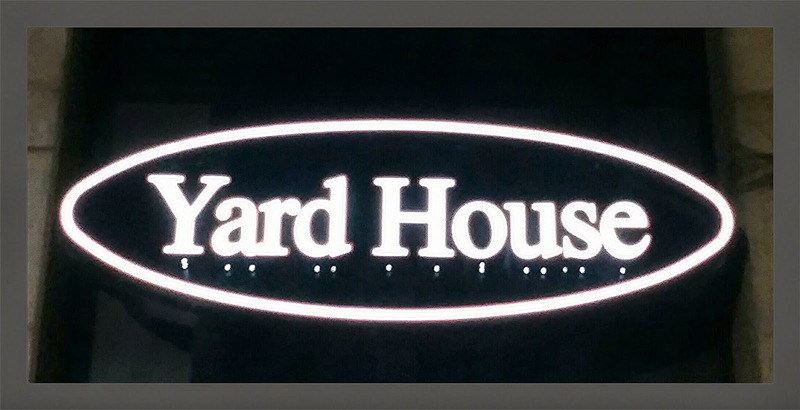 The Yard House brand was first launched in 1996 in Irvine California and grew to over 39 restaurants across 13 states. 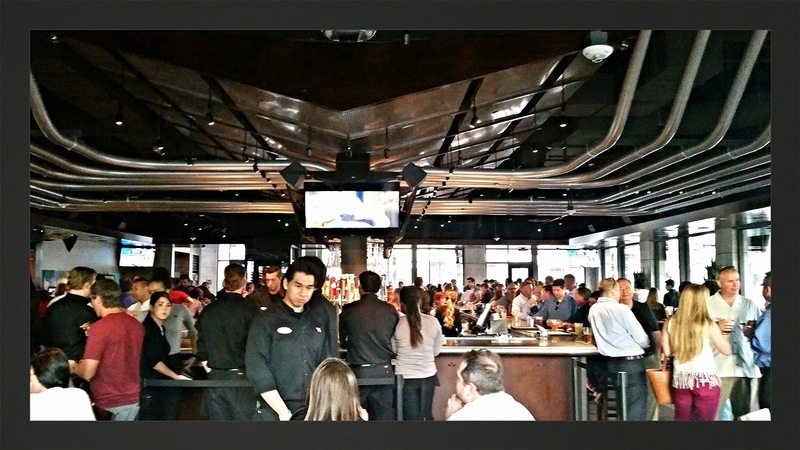 The vibe inside of most Yard House restaurants is energetic and uplifting with modern and cool music playing. 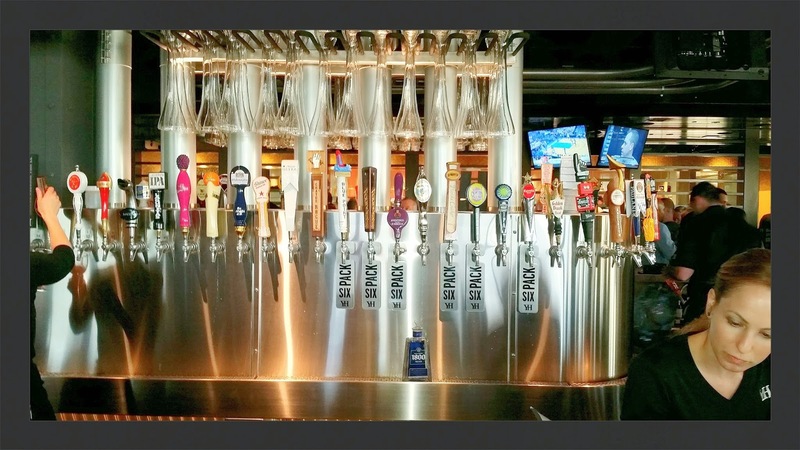 In addition to a great selection of eats, the real wow factor for Yard House is the beer selection with over 140 beers on tap at any given time. All beers are kept in a state of the art glass-enclosed keg room that is kept at a constant 34-36 degrees and the keg room can house as much as 5,000 gallons of beer at one time. The beer is delivered fresh and kept chilled by miles of overhead steel and nylon beer lines that flow to the central bar. Guests can order their favorite draft beers as a half-yard, traditional pint, shorty or a six-pack sampler. 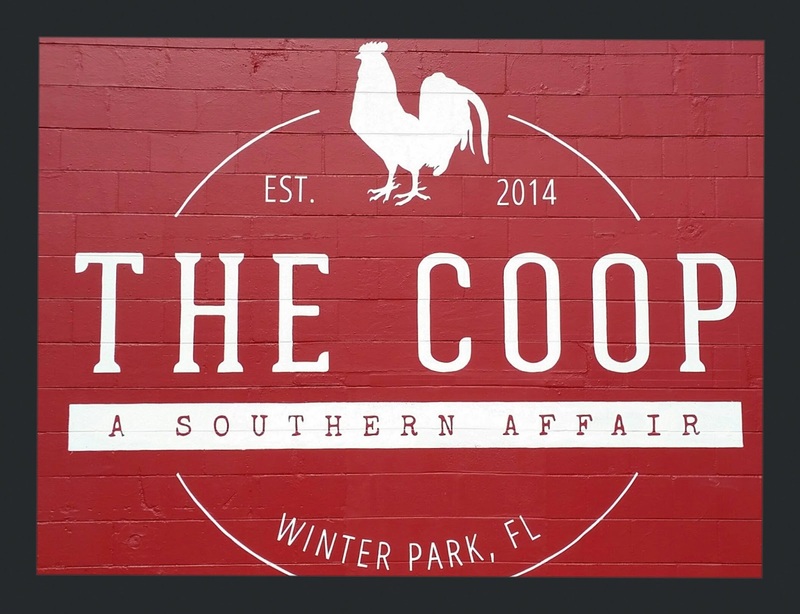 The beer list for this location will also feature selections from Florida breweries, including Florida Beer Company and Cigar City Brewing. If over 140 variety's of beer isn't enough to get you excited, they also feature a few different Beer Cocktails. A Beer Cocktail consists of beer and a variety of ingredients like aromatic bitters, mixers, fresh fruits, and of course alcohol. The Dreamsicle (above left) was my favorite. 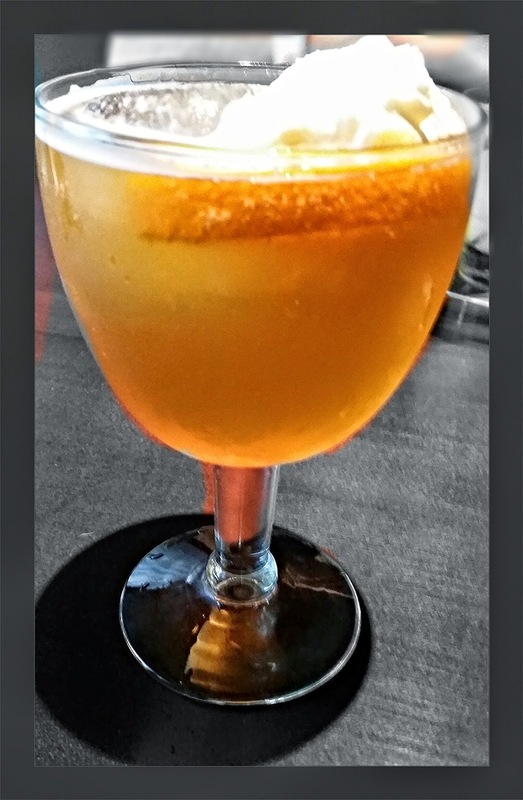 It is a combination of Pinnacle whipped vodka, Cointreau, citrus agave, orange bitters and white ale topped with whipped cream and a fresh orange slice. The Sunburn (above right) was my guests favorite. 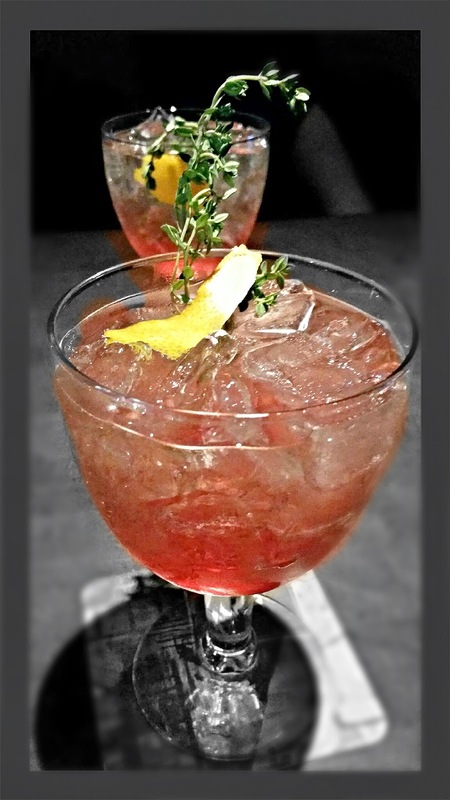 This beer cocktail is made up of St. Germain, Malibu pineapple rum, orange bitters, cranberry juice, pear cider, and is garnished with fresh thyme and an orange peel. Of course they have a variety of other cocktails available at Yard House also. 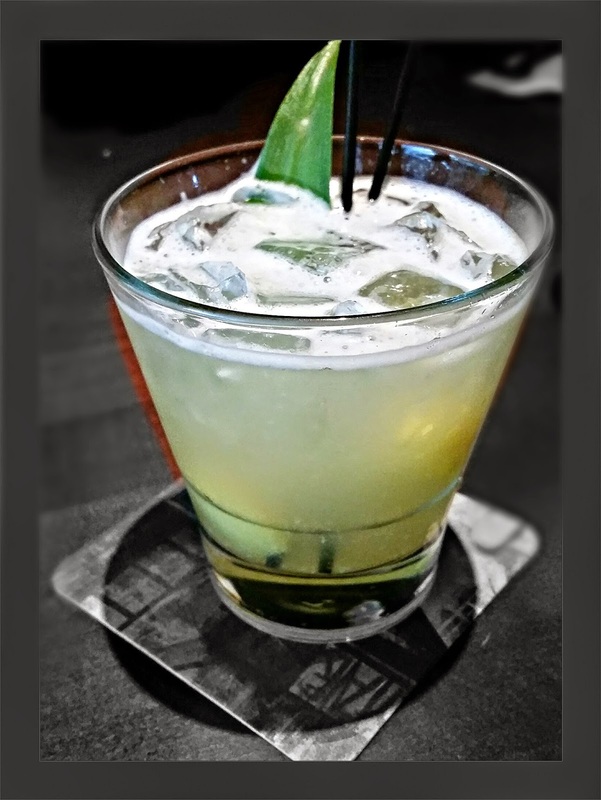 The Pineapple Express features Skyy infusions pineapple vodka, Malibu pineapple rum, Monin mojito, fresh pineapple and mint. 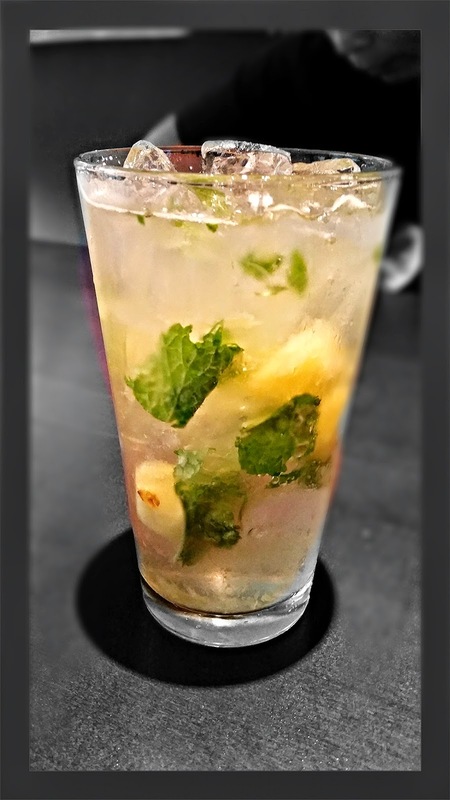 The Brazilian Lemonade has a mix of Cruzan citrus rum, Cointreau, lemonade, Monin mojito, fresh lemon and mint. Getting back to those great eats, It should be noted that Yard House has over 150 items on the menu, in case you did not think they take food just as seriously as they do beer. The menu at Yard House offers a little bit of everything from chicken wings to onion rings all the way to sushi and sashimi for appetizers. They have salads, burgers, tacos, seafood, steaks and even pizza is available. 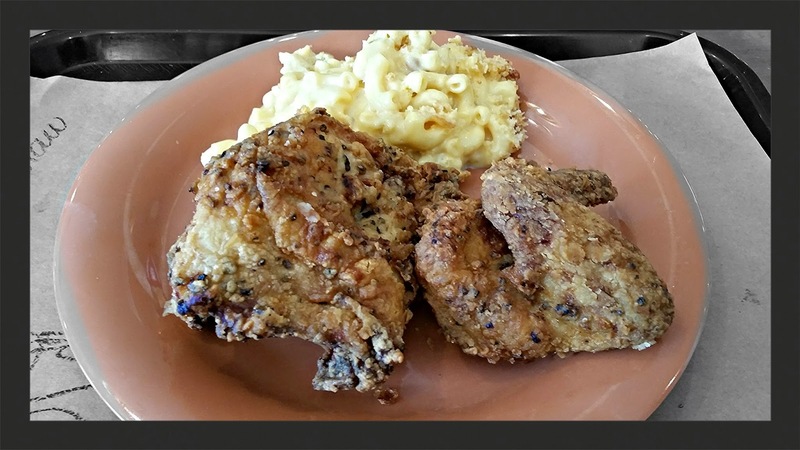 Some of the house specialties include Southern Fried Chicken Breast served over spinach-corn mashed potatoes, and a Mac & Cheese dish made with campanelle pasta and topped with appleweood bacon, wild mushrooms, cheddar, Parmesan, and truffle oil. Since it was a preview event, I did not get to taste whole dishes, but the samples that we did get were very tasty indeed. 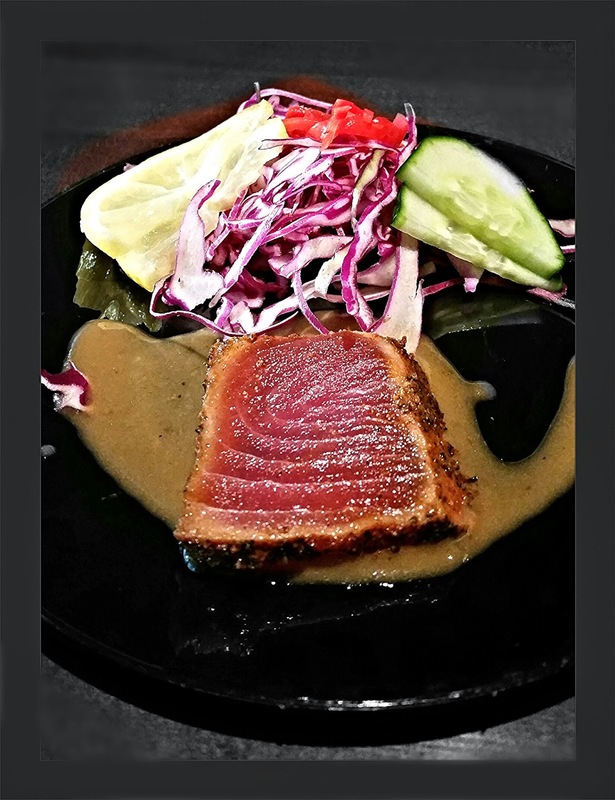 The Seared Ahi Sashimi that is available as an appetizer, was very good. It was seared nicely and lightly blackened and was served with soy vinaigrette, wasabi and pickled ginger. The Grilled Korean BBQ Beef was another great appetizer. 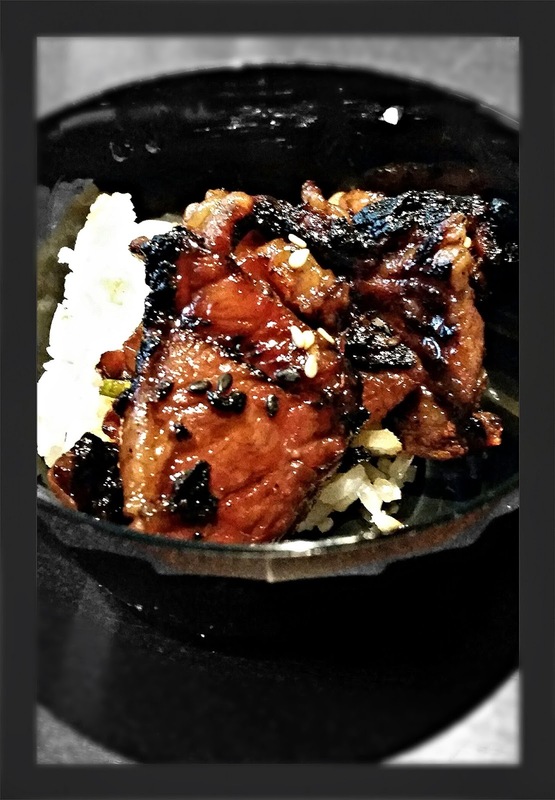 The marinated boneless short ribs had a very nice char and was packed with flavor. 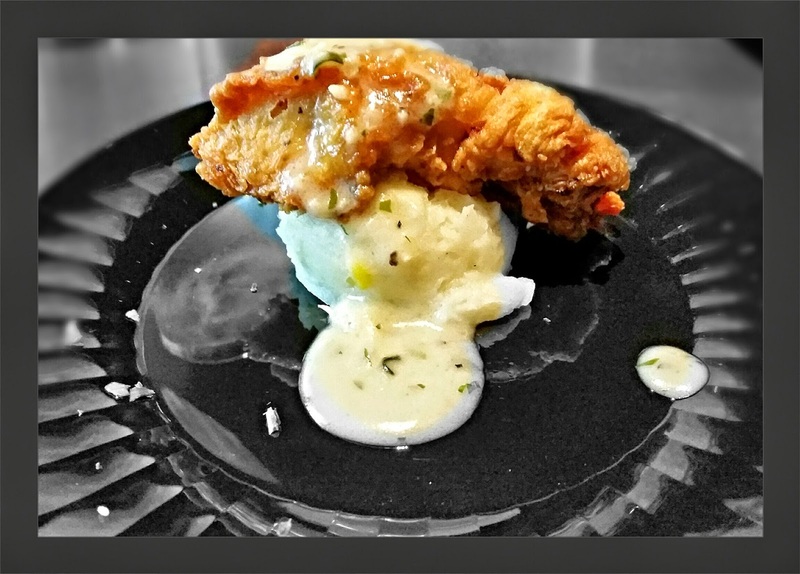 A small sample of the Southern Fried Chicken with spinach and corn mashed potatoes. This trial size cheeseburger was causing quite a stir at our table during the preview event at Yard House. I can personally attest to eating three of them because they were that good. The Mini Creme Brulee was a fantastic desert. Taking a traditional vanilla bean custard and topping it with caramelized bananas and filling it with chocolate on the bottom...is always a good thing. We sampled a variety of other offerings like the Pepperoni and Mushroom Pizza, Blackened Swordfish Tacos, Shiitake Garlic Noodles and the Penne with Chicken, all of which tasted really good. In addition to its full menu, the restaurant offers an “Eat Late” menu available only after 10 p.m. that includes a Black Truffle Cheeseburger and a Pastrami Dog. 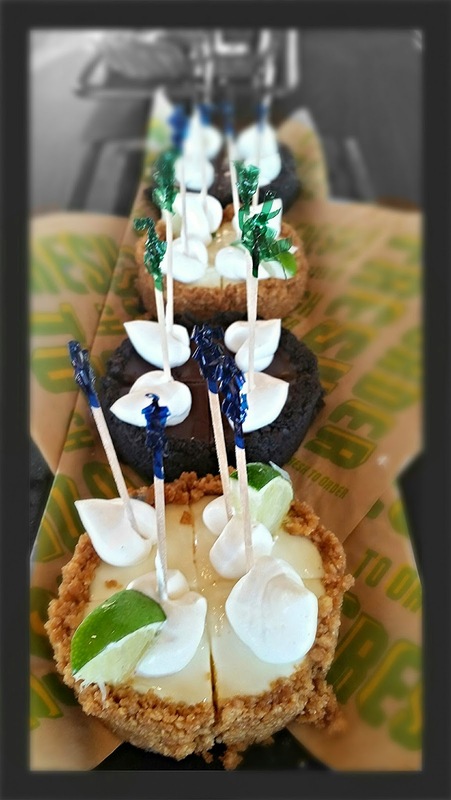 Some of the more unique items include Chilaquiles (crisp tortilla chips, onion, egg and smoky chipotle sauce topped with jack cheese, sour cream, guacamole, tomatillo sauce and a fried egg) and Monte Cristo Pops, which are just mini versions of the original Monte Cristo, but gets a side of Jalapeno Peach syrup. Those "Eat Late" items a sound like the perfect way to help soak up all those beers and beer cocktails you are sure to sample when you visit. Yard House is open daily for lunch, dinner and late night dining. The new restaurant spans nearly 14,000 square feet with seating for more than 300 guests inside and 80 more on the large outdoor patio. We really liked Yard House...at least from the preview. I am planning a return visit soon, and look forward to trying out some other items like the Mac & Cheese and perhaps a few more beer cocktails. Cocina 214 is celebrating Cinco de Mayo with a weekend-long fiesta that includes a two-day block party (May 3 & 4) with the 2nd Annual Running of the Chihuahuas and a Patron ice luge event. All day Saturday and Sunday, a local DJ will be spinning Latin and Top 40 hits, while ambassadors from participating partners, Jose Cuervo and Corona, serve up drinks. On Sunday May 4th, locals can enter their dogs into the 2nd Annual Running of the Chihuahuas ($12 in advance or $15 at the door), with all proceeds benefiting Winter Park Lost Pets and A Cause 4 Paws Rescue. 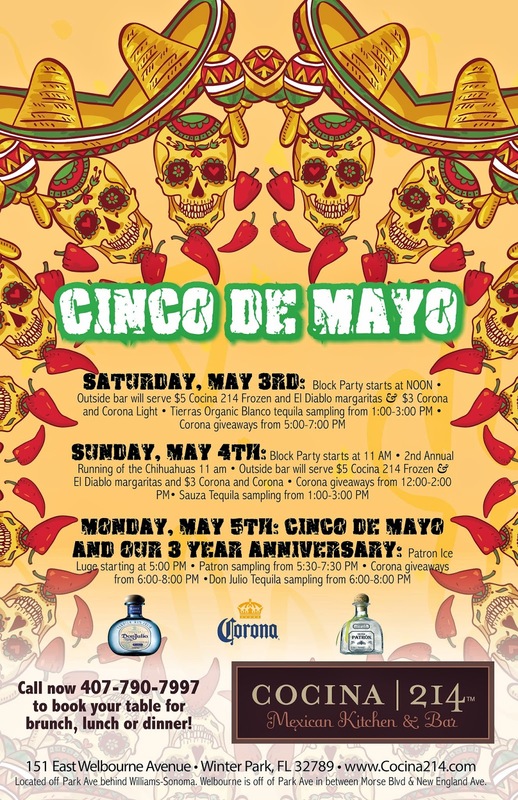 The party will continue on Monday May 5th for Cinco de Mayo as the restaurant celebrates its three-year anniversary with a Patron Ice Luge at 5 p.m. followed by Corona giveaways and Don Julio tequila samples. WHEN: Block Party is Saturday May 3rd from 12:00 p.m. to 7:00 p.m and Sunday May 4th from 11 a.m to 3 p.m.
Patron Ice Luge: is Monday, May 5, 2014 from 5 p.m. – 8 p.m.